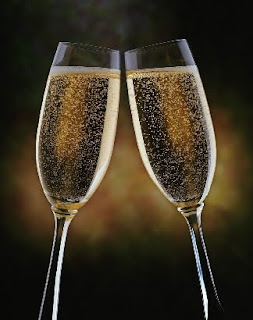 "For auld lang syne, my dear"
Today's the day to grab a glass, and toast to the new year! Have a happy and blessed 2010 to all!! I'm way behind with this song, but I just heard it by recommendation from a friend and I am in love with it! It is called "Winter Song" by Sara Bareilles and Ingrid Michaelson. It's a beautiful song, and I love that it is for winter so it is the perfect time to be enjoying this song! Well, sadly Christmas has come and gone. Not to worry though, there is still New Years! I hope everyone enjoyed their Christmas as much as I did, and I hope Santa was good to everyone.. he was sure good to me! My favorite gifts have to be a new Lilly skirt from bRc, black riding boots from santa, tennis bracelet from my wonderful parents, and many beautiful pieces of clothing! What was your favorite gift? 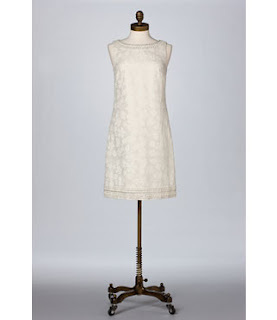 Lilly Pulitzer- I have been eyeing this dress for some time now, wouldn't it be the perfect fit for a New Years soiree? Proenza Schouler-Barneys- Love love love this dress in the dusty rose color but I couldn't find a picture that I could upload to blogger so click the link to see the pretty pink hue! Kate Spade- Just enough dazzle! J.Crew- This bright pink will make you stand out, but the classy cut will be the true envy of everyone! I hoped you enjoyed the bountiful sequins and shine! What do you plan to wear for New Years? Have wonderful day! From my home to yours, may your family have a truly blessed Christmas. And although at times it's hard to get wrapped up in other things at Christmas, remembering the reason why we are celebrating is most important. "God Bless Everyone". "Merry Christmas to all, and to all a goodnight!" Of course you all recognize this as the sleep mask, Audrey Hepburn in Breakfast at Tiffany's wears. Well it can be yours for the small price of $14 found here. Fred Flare to me, is a very "out there" store, and often times I stop at their website just to get a laugh or see what ridiculous things they have to offer, well they really caught my eye when they featured this! This would make a great stocking stuffer! Also, check out the Starbucks website (here) and register your Starbucks card for a freebie on your birthday! 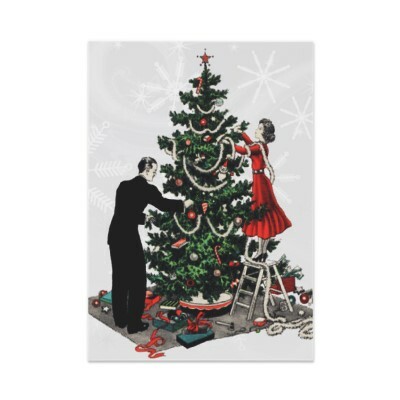 Have a wonderful day, just 3 days until Christmas!! Here are just a few pink, green, and preppy finds I came across this weekend! 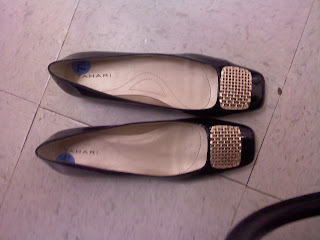 Love these elie tahari flats for just $40 at TJ Maxx! 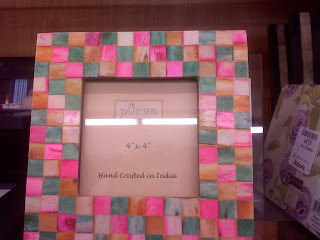 Another great pink and green find at TJ Maxx just $7.99! 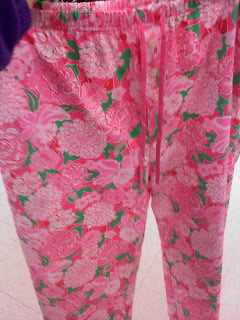 Lilly PJ bottoms for just $20! They had several other Lilly dresses but none were in my size! 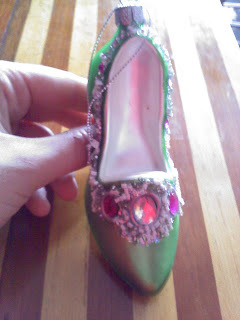 Pink and green shoe ornament (Macy's) for an ornament exchange! Have you found any great finds recently? I have yet to check out Marshalls to see if they have any great finds as well! Have a wonderful Monday! This song is so beautiful, it deserves it's own post. It's called "I'm There Too" by Michelle Featherstone. I first heard it on So You Think You Can Dance when Travis Wall choreographed a beautiful dance to it. Her voice is amazing, and it is such a calming song with such loving lyrics. Normally I am not one to like these types of songs (think Sarah Mclaughlin style) but I just can't help but love this song! Have a wonderful day and a happy happy weekend! Kate Spade does it again! This beauty of a Kate Spade tote can be yours for just $205.99. 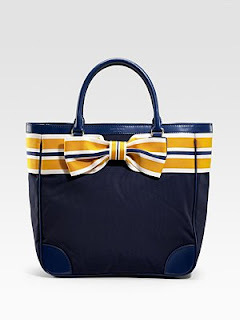 I'm not only in love becuase it has a gorgeous bow on it, but it is also my alma mater's colors! Hello Christmas list!! Plus another big bonus is that Saks is offering free shipping with the code SAKSSHIP9. Have a fabulous day! In the media today, you're hard pressed to find a decent role model. Sure some are beautiful, yet they make poor decisions. Sure some are wonderful, but they just don't seem to fit the bill like Jackie O did or Audrey Hepburn did. Well here are some of my favorite women role models of today. They manage to keep their images mostly clean which leaves them with much respect. Who are your women role models of today? I'd love to know! Have a wonderful day! Well I am officially done with my fall semester! I managed to do extremely well gradewise and was aceppted into my major (minor screaming and jumping went along with this news! ), so this weekend was a great end to a great semester. My family and I along with family friends headed to Washington, DC for a weekend of sightseeing! The first night, we headed to the Old Ebbitt Grill for dinner which was nothing short of delicious! We then went for a walk and saw the whitehouse and the christmas tree which was beautiful! Above: cCm and I at Old Ebbit Grille. I had the petit filet bernaise and she had the shrimp wrap! The next day we visited the holiday market which was so neat. If you live in the D.C. area, you should check it out; there were many vendors show casing their crafts and art.Then we headed to the national archives and lucky for us the Declaration of Independence was out that day. We also went to the Smithsonian Natural History Museum and saw the gorgeous Hope diamond along with some other exquisite jewels. Now for the best part of the entire trip: Oya. This restaurant was simply and absolutely fabulous. I reccommend it to everyone. It's somewhat of a dressy place, which I loved. The ambience had a cozy modren feel. The whole menu has an asian flare which I loved becuase they had an entire page of sushi (I ordered the Salmon Tempura and the Tuna avocado rolls=Fabulous). Their price point isn't too pricey. I would say the prices range anywhere from $10-$30 depending on what or how much you order. Sushi was 6-8 rolls for around $10-$15 which I consider a good price. They also have a prix fixe menu that is $29 and it includes an appetizer, entree, and dessert and they also offer a $19 lunch prix fixe. For dessert I had a taste of the chocolate cake and the sorbets which were out of the this world. The sorbets were so flavorful, I would highly recommend them. Also, the drinks are so diffferent and intersting. They also offer a very extensive wine lists with wines from all over the world. They offer a wine flight where the pair a different wine with each course of your meal. If you have not gone to Oya, it's definitely the place to go! aBr and I sharing a smile at Oya, even at age 11 you can love this restaurant! The next day we headed to Georgetown for a morning of shopping! We headed to Patagonia, RL Rugby, Vineyard Vines, and Lacoste. Of course before our departure, we could not resist stopping at Georgetown Cupcake. I just may have one left over to eat today! I loved the Vanilla2, It was the perfect flavor combination of creamy icing and vanilla cake. Mother loved her gingerbread, and my father loved his Chocolate2. cCm preferred the red velvet which is the one I am going to try today! Celebrate Me Home, Once Again!! 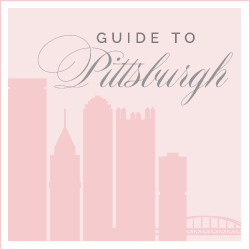 I am once again headed back to the wonderful Pittsburgh, PA. I am free from schoolwork for a month! (finally breathe a sign of relief!) But before I head back to the 'burgh, I am headed to wonderful Washington, DC for a long weekend getaway with dear family friends and my family. 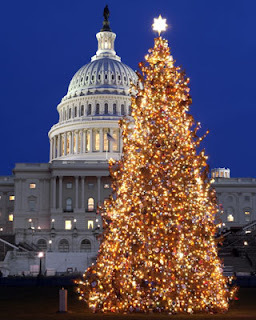 I am so excited to see Washington at Christmas, and my parents will be sure to visit the white house Christmas tree because that is where they got engaged, and this year marks their 25th anniversary, how exciting for them! I cannot wait to share with you all my wonderful trip! Stay tuned! Have a lovely weekend and for all my fellow college students out there, may you make it home safely for a wonderful break! Labels: capitol building, celebrate me home lyrics, christmas, christmas at the capitol, christmas in washington, preppy, vacation culture, washington d.c.
One of my classic summer staples can now become a classic winter staple as well. The Greenwich boots are the perfect brown boots, and you and I both know the quality will not fall short of fabulous. Have you purchased a pair of JR's new line of flats and boots yet? I cannot wait to test them out! Have a wonderful day! I hope these are some eye candy for your day! Have a wonderful Tuesday! 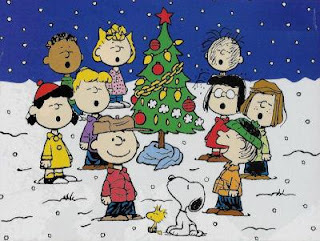 Only 17 days until Christmas! Harry Potter and the Half Blood Prince is out on DVD today!!! I cannot wait to get a hold of a copy!!! I am loving the new Lilly bathing suits!!! The above print is my favorite, and I love the bandeau top! I cannot wait to sport this, this summer (or even better, this winter in a hot tub!).. what do you think of the new bathing suit line? I am also eyeing this beauty, it's the mila dress printed. I think it is so different, and who wouldn't want to wear a Lilly gown? I sure do! Have a wonderful day!! "Bewitched, Bewitched, You've got me in your spell"
Remember this show? Oh how I love it! Every once in a while, I'll catch it on TV, and every time, I fall in love again! 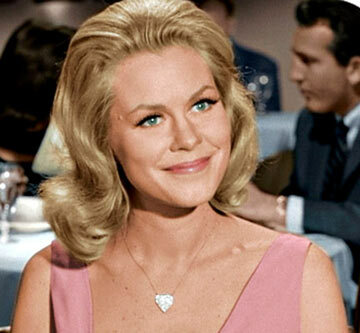 I just love Elizabeth Montgomery's character, Sam. She is such a great actress and I think she plays her part so well! 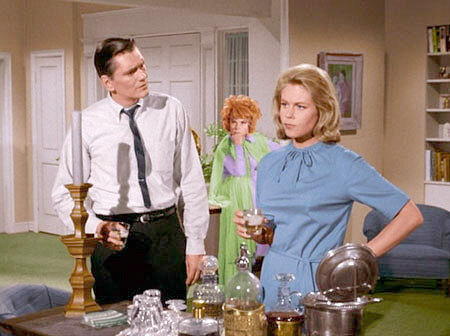 Plus, for it airing in the '60s (the first episode being in 1964), Sam's clothes are too cute! Half of the clothes I see her wear, I would wear now. 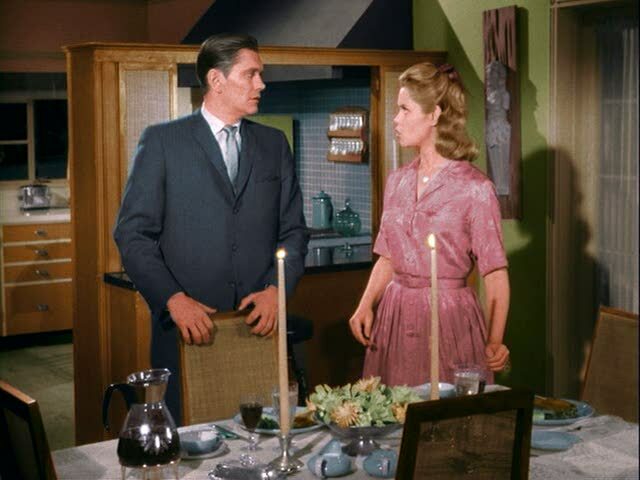 Darrin and Samantha are a picture perfect American Family in the 1960's. If the cut was just a little more modern, Sam's pink wrap dress would be perfect! I love this blue dress she is wearing with the sash around the waist. It's modest yet fashionable, plus that blue hue looks great on her! I love her hair in this picture, it's such a "diva" picture of her. I wish I could see her dress in this picture, I'm sure it would have been so pretty! Were you ever a fan of this show or Elizabeth Montgomery? Have a great day! Happy December! The countdown begins! 25 days to Christmas!